I Love My Amazing Animals: Hey Friends!!! Whew, what a week! My son and I got home from vacation in the beginning of the week and as you can see, my granddaughter is thrilled!! All my dogs were too! They greeted me at the door and it felt nice to know that they missed us! Well, since then, I have been putting in 12 hour days at work and for the month of August, I am going to be swamped, so if you don't see me around much, that's why! So tonight and tomorrow, I'm going to visit everyone and try to catch up! do you have another job? I know you watch your granddaughter and do Mary Kay. This picture is just adorable!! 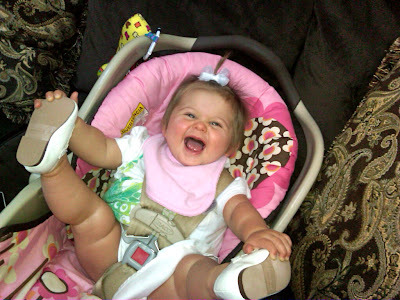 OMD, she is just so adorable - she sure looks like a very happy little girl!!! Awwwww!! Your beautiful granddaughter is so adorable!! What a sweetie!! That is a GREAT photo of your very happy granddaughter! What a doll, can almost hear her delighted squeals. Your granddaughter is just adorable! We're glad you're back, Deborah! What a cute picture! Hope you find some time for yourself between those work days! Welcome home! That's my favorite part of coming home, even if it's just from the store - seeing how happy it makes my puppies when I come back. Sorry you'll be working so hard to catch up on all the work you missed. Yuck! What an adorable little girl!!! !